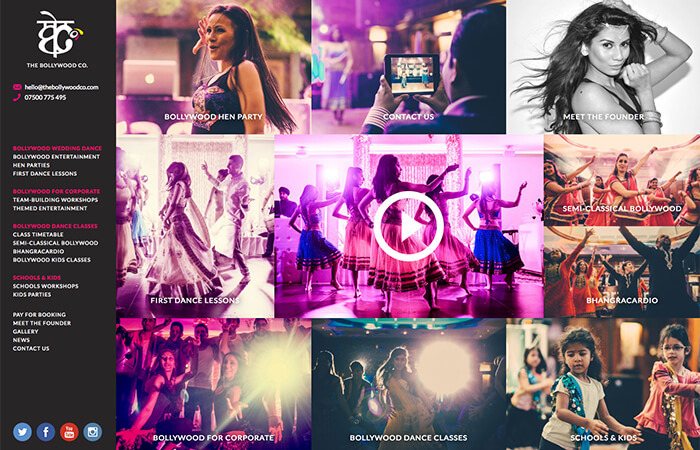 Having worked with Nileeka for several years, I was again asked to work with her on a redesign of their website for The Bollywood Co. The web design needed to be very high-end and set them apart from their competitors, making use of their colourful and striking photography. The result was a dynamic website that makes great use of their sleek branding and fully adapts to browser size. I found Tim whilst looking for inspiration for my own website, trying to find attractive sites that oozed creative design, balanced with functional/user-friendly build. Within 24 hours, he had emailed me back and it was clear that he was just the type of person I was looking for! He was so easy to work with – within the past eight months, he has built three websites for me, each of which are completely integral to my day-to-day business. Tim doesn’t just build websites… he truly adds value to brands. Without Tim, my brand would not be where it is today. Nileeka Bose, The Bollywood Co.